NASA Earth Observatory image by Lauren Dauphin, using VIIRS data from the Suomi National Polar-orbiting Partnership. Caption by Mike Carlowicz. 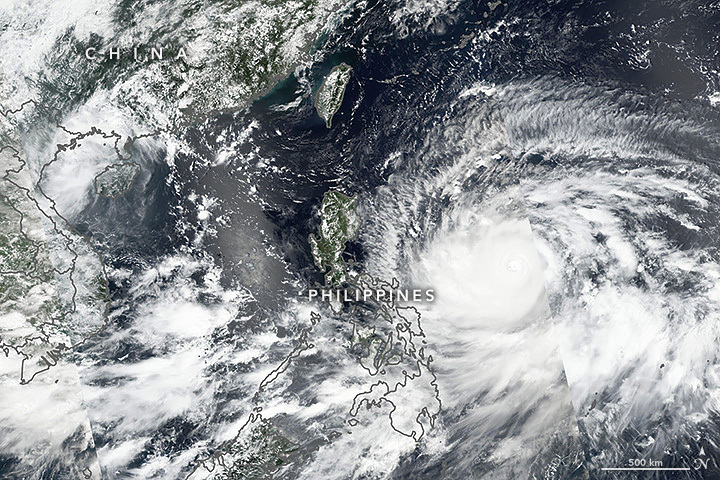 Thousands of people are evacuating from the coastal lowlands in the northern Philippines in anticipation of Super Typhoon Mangkhut (known locally as Ompong). The storm is the strongest to approach the nation in 2018, and it is expected to cross northern Luzon, home to millions of people, by September 15. Officials are planning for significant storm surges and rainfall. 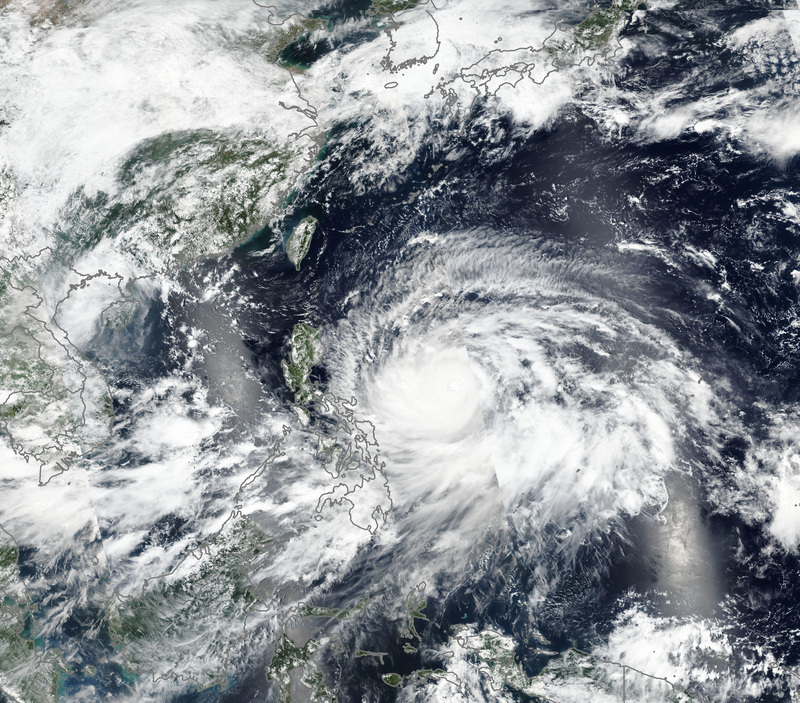 On September 13, 2018, the Visible Infrared Imaging Radiometer Suite (VIIRS) on the Suomi NPP satellite acquired this natural-color image of Mangkhut just after midday. The line across the storm is a “swath edge”, or seam, in the satellite data between two consecutive passes of the polar-orbiting satellite. Around the time that the image was acquired, the U.S. Joint Typhoon Warning Center reported that the storm had sustained winds of 145 knots (165 miles/270 kilometers per hour), with gusts to 175 knots. Maximum significant wave heights were 50 feet (15 meters). BBC (2018, September 13) Typhoon Mangkhut: Millions in Philippines braced for storm. Accessed September 13, 2018. Philippine Atmospheric, Geophysical and Astronomical Services Administration (PAGASA) (2018) Tropical Cyclones: Severe Weather Bulletin. Accessed September 13, 2018.